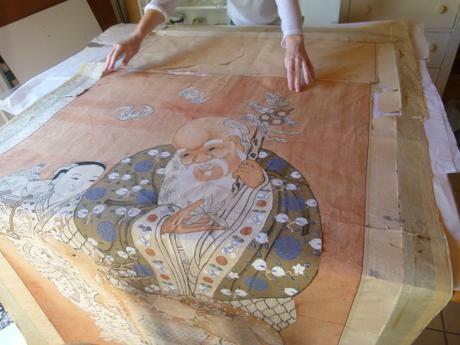 I recently got the opportunity to work on a Chinese silk woven textile, known as a kesi. It’s such a beautiful old piece! The textile is a Chinese tapestry. The image comprises an old man, a young boy and a deer. The background colour is predominantly orange. The decoration on the clothing of the man and the boy, as well as the spots on the deer, is paint which has been applied on top of the silk weave.